It’s that time of year again where you’re likely to get invited to a variety of holiday parties. Some of these parties may be through your employer while others may be non-employer related, yet still be in a professional setting. Even at parties with family and friends, there is still often opportunities to build your professional network. 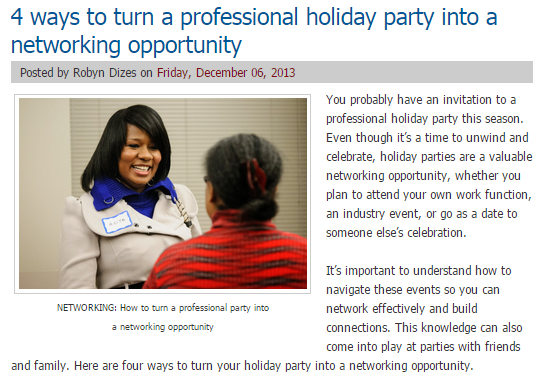 With that said, we thought it may be helpful to revisit some of our tips we published last year about how to leverage these holiday parties for professional networking. Identify who you want to speak with. If you’re attending a larger holiday party, it can be the only time you get to speak with certain individuals in attendance. Research who you want to speak with in advance that aligns with your interests. Take advantage of the opportunity. A holiday party is also a great time to network with the president or executive team of your employer, college, or industry group. When approaching high-ranking officials it’s critical to remain professional, despite the fact that you’re at a party. Start the conversation now and follow up later. The holiday party is usually a time for professionals to enjoy time off from work with friends or family, so they might not want to discuss business. Remember, this is the beginning of a conversation and it doesn’t have to take place only at the party -- you don’t want to go into full-on business meeting mode over eggnog and fruit cake. Always act appropriately. It might be a party, but there’s no reason to go over the top when attending a holiday event. First impressions are lasting impressions, so avoid consuming too much alcohol and ask your date to do the same. Good luck on your networking at this year’s holiday parties. It’s a great opportunity to set the tone for 2015! To read the entire article and see even more tips, click to read the original post. Welcoming our 2014 Delta Mu Delta Inductees!